code of conduct – A quirky yet practical look at the inevitable. Meet Maree Bolding. She’s a funeral celebrant and a passionate volunteer at the Central Victoria crematorium. 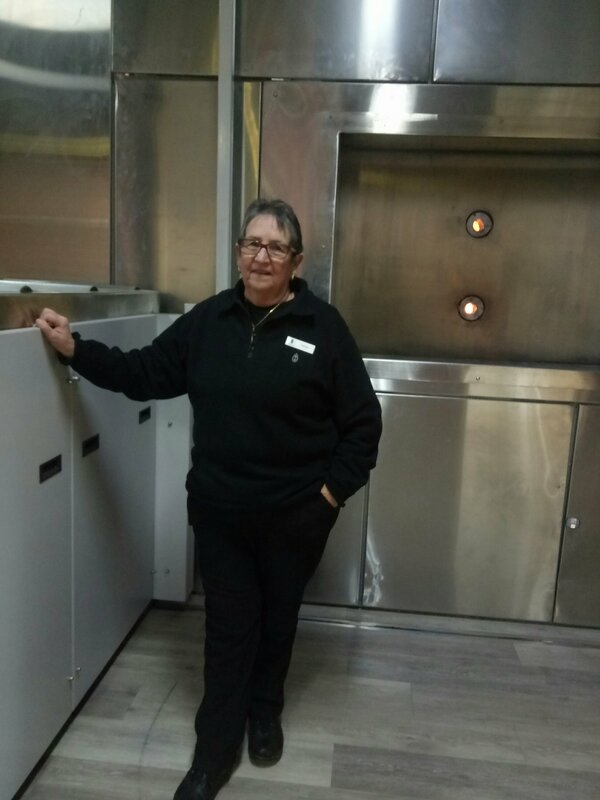 Yes, while many of her friends may volunteer at the local hospital, Maree spends her free time at the crematorium in Bendigo, doing her bit to give the deceased a respectful and loved farewell. Maree Bolding stands in front of one of two cremators at Central Victoria’s crematorium. A passionate volunteer at the Bendigo facility, she says it’s a privilege to be trusted with a loved one’s final journey. I use the term ‘loved’ because, as Maree gave me a tour of the cremation facilities, it was obvious she loves what she does and is committed to treating the deceased like they would be treated if they were still alive. “I call them by name. I talk to them. “I’ve been given a big responsibility to care for these people on behalf of their families,” she said. And care for them she does. Upon leaving the crematorium there was little doubt that I wanted someone like Maree to attend to someone I cared about. She offered great care to people who could no longer speak for themselves. Unfortunately it seems not all in the funeral industry share the same ethics. There’s a damning allegation that has thrust Queensland’s funeral industry and lack of regulation into the spotlight and has reaffirmed the general population’s scepticism about an industry often thought of, rightly or wrongly, as deceitful and manipulative. The Courier Mail broke the story of a coffin swap by a Qld funeral director on Jan 11. A Rockhampton funeral director is accused of ‘coffin swapping’ – taking the deceased out of the $1,700 coffin her family purchased for the funeral and then putting her in a cheap coffin for the cremation. Let me be clear here: Not only is this appalling, it is also illegal. The funeral company involved has denied any wrong doing. 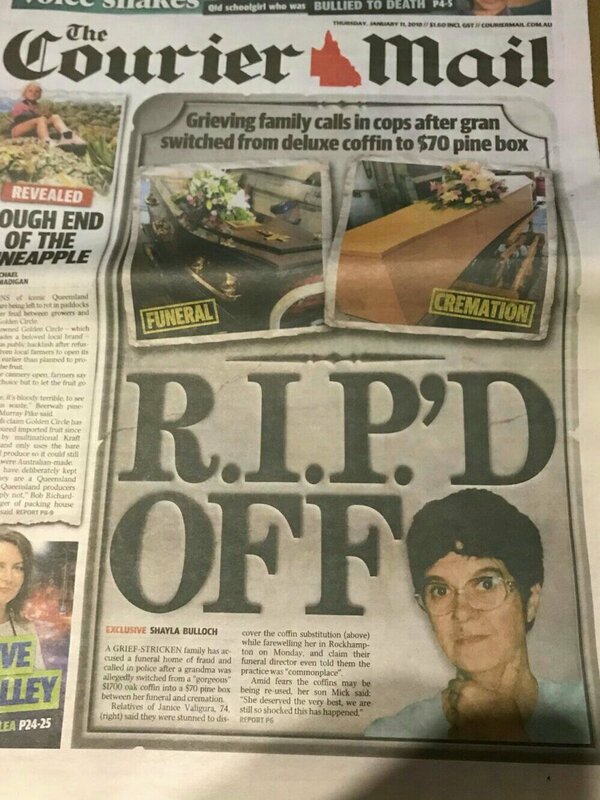 The story of this alleged dodgy behaviour by a small funeral business has received widespread coverage and has seen thousands of people taking to social media to voice their disgust. I’ve been following those online conversations and this is where is gets interesting. Overwhelmingly, people are saying how atrocious allegations of coffin-swapping are. No surprise here. Many are saying they had always suspected such a practice was common-place. I’m not convinced of that. However, my chats with funeral directors have made it obvious that some of them believe it does happen. Interestingly on ABC Radio today, Darren Eddy from the Australian Funeral Directors Association said he’d never heard of “coffin swapping”. Without a doubt, Facebook comments reveal a widespread and deep distrust of the funeral industry. No real surprise there either. It’s unfortunate because the industry as a whole is trying harder than ever before to be more transparent. But it only takes the odd rogue operator to render those efforts null and void. 3. People have NO idea about the price of coffins. Hardwood coffins can easily reach the $10,000 mark. Sure, they’re beautiful but is it practical to burn or bury such expensive bits of wood that took decades to grow? 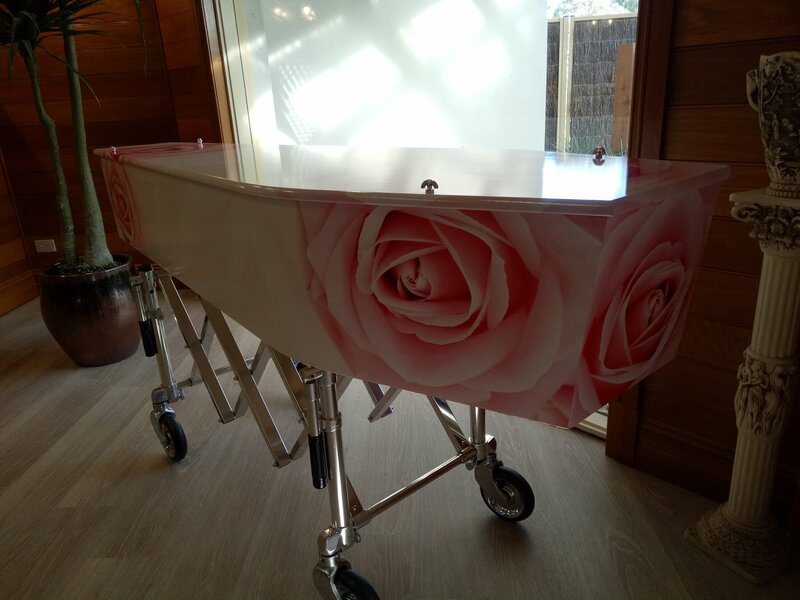 Many people think it is and that’s why funeral directors offer these high-end coffins as options. 4. People are open to the idea of rental coffins. Not many funeral directors offer this option but rental coffins are actually a thing. Tobin Brothers, for example, offer a “chipboard inner capsule encased in a solid timber outer shell, which is removed prior to cremation”. You might think a rental coffin might be an inexpensive option. Wrong. Tobin Brothers offer the option for $1,700. 5. Would Government regulation stop “coffin swapping”? No. I’ve written about the confusing state of the Qld funeral regulations in a recent blog. The legislation is a quagmire and the hands-on operations of funeral directors and crematorium operators are widely unseen. We simply don’t know what happens behind closed doors. Cemetery and crematoria infrastructure in Qld is either run by Local Government or private enterprise. There’s no consistent or over-arching regulation that keeps an eye on these. 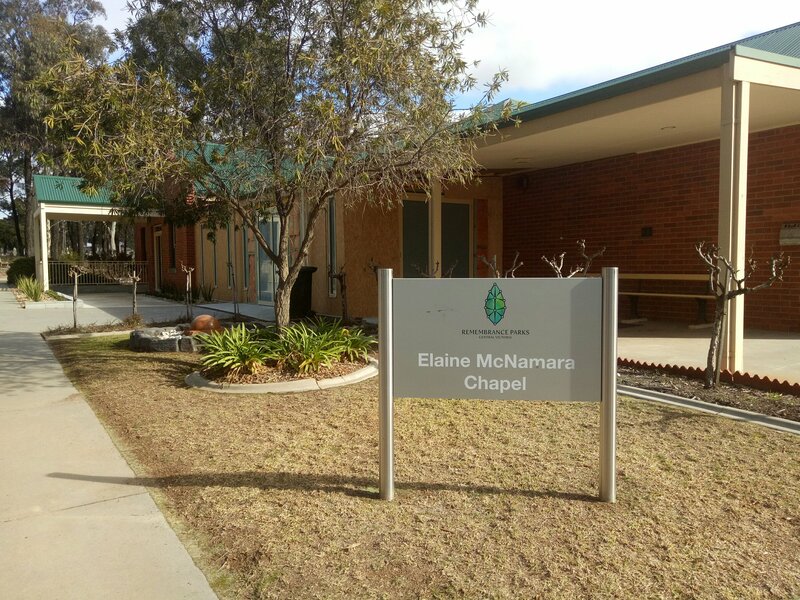 In Victoria however, crematoria are run by Trusts, with the trustees appointed by the State Government. This means there’s no real incentive or opportunity to operative unscrupulously to make a quick buck. Does the Qld community want more State Government regulation when it comes to cremations? In this case, the online response seems to indicate that the answer is YES. Unlike Qld, Victorian cemeteries and crematoria, like this facility in Bendigo, are run by Trusts set up by the State Government. 6. The discussion: people are talking!! If nothing else, this claim of coffin swapping certainly has people talking, and that’s a good thing. Thousands of people have taken to social media and given the issue measured thought and are openly taking about what they want for their funeral and sharing their own experiences of the funeral industry. It’s revealing that the discussion about the inevitable isn’t necessarily seen as morbid these days. Times are changing and people want to be better informed. With dark stories like coffin swapping around, how can you ensure your beloved family member gets the farewell you want for them? Start by doing your homework. Meet your funeral directors. Ask for a tour of their facilities. Do this with some mates now, instead of at a time when you’ve lost a loved one, are grieving and not making clear decisions. Just like you’d research a bathroom renovation and get quotes, do the same with several funeral directors. I’ve not met a funeral director yet who wouldn’t welcome a potential client’s questions. In Queensland there’s a voluntary Code of Conduct that aims to ensure funeral directors are transparent and ethical. Ask if they’re signatories to that Code. Also, are they members of the Australian or their state Funeral Directors Association? While this alleged “coffin swapping” incident is horrifying, don’t let it dictate your entire view of the funeral industry. There are passionate people like Maree Bolding who consider it a privilege to care for your loved one on their final journey. I’m positive she’s not the only one. There are many coffin and casket options to suit a wide range of budgets. Discuss with your loved ones what type of coffin you want before the time comes. That way, they won’t feel like they have to spend 10K on your casket.